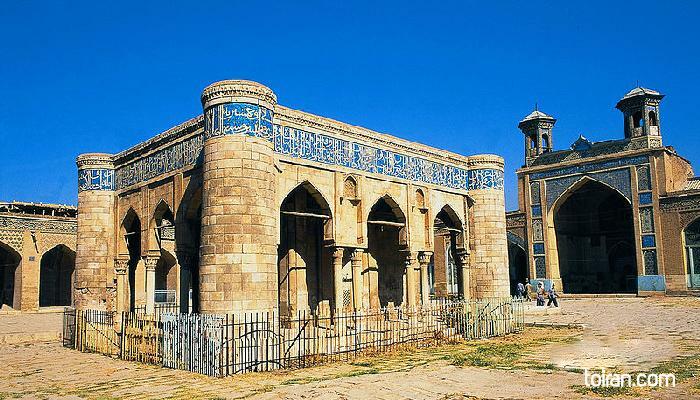 Jame Atiq Mosque of Shiraz is one of the oldest religious monuments of the city. The mosque was built by Amr ibn al-Layth in the 9th century. The mosque, which is two-stories in some parts, has six doors, several shabistans (inner sanctum), chambers for seminary students, stone pools and a marble courtyard. Naskh, Thuluth, and Kufic hand inscriptions have been used to decorate the mosque with Quranic verses and catalogue the several renovations of the structure. The Mihrab (prayer niche) of the mosque has pleasing turquoise tilework. The mosque also has muqarnas, decorative ironwork and khatam embellishments.